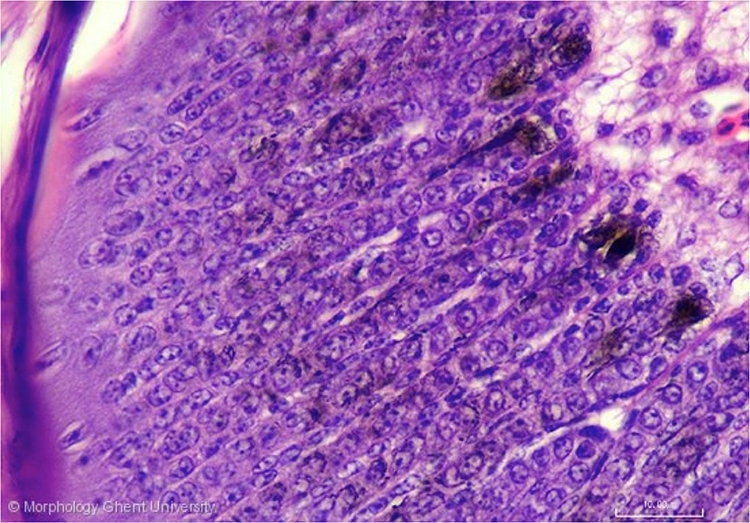 In the part of the feather wall that is shown on the micrograph above, the barb ridges are still very simple, existing of only a thin row of intermediate cells bounded by a row of flattened basilar cells, the marginal plates. Melanocytes are incorporated at the inner side of the wall and send out processes along the sides of the barb ridges. The accumulated melanin granules (melanosomes) are shed at the tips of these processes and are phagocytosed by the cells of the barb ridges, starting by the outermost cell layer. Deposition of pigment begins before keratinization but is gradually overtaken by this process.